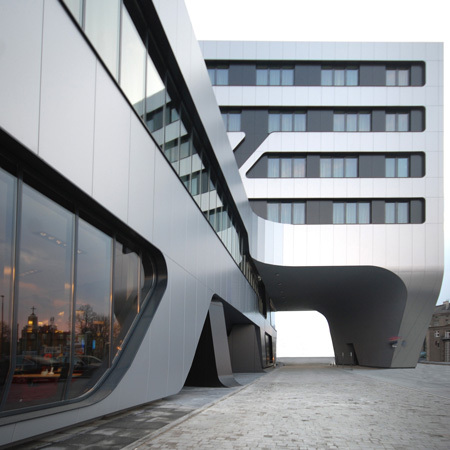 A hotel designed by Berlin architects J Mayer H, Krakow practice OVOTZ Design Lab and GD&K Consulting opens today in Krakow, Poland. Called SOF, the building is clad in aluminium with windows framed by dark horizontal bands across the facade. Photographs are by Jakub Kaczmarczyk, Ovotz design Lab. October 8th 2009 marks the opening of SOF, the new Hotel Park Inn, Krakow, Poland designed by J MAYER H architects in collaboration with GD&K Consulting Sp. z o.o. and OVOTZ Design LAB. The hotel is being constructed in the city centre, at the intersection of important transport routes. The hotel is located in the vicinity of the planned Congress Centre as well as near to the Wawel Castel and the histrorical Jewish district. It offers splendid views onto the old city centre. The new property is characterized by clear horizontal line, picking out the panorama-view as a central theme. The Facade is emphasized by black and white aluminium stripes, seperated by dark glass windows. Investor: SOF Debniki Development sp. z o.o. Architect: J Mayer H Architects with OVOTZ design Lab. General Constructor: PORR (Polska) S.A. Interior Design: JOI-Design GmbH with OVOTZ design Lab.